#Packers secondary has Gunter, Randall, Rollins (nickel), Burnett (dime), Clinton-Dix, Evans. Brice (shoulder) and Hyde (shoulder) are hurt. Falcons, facing third-and-10, exactly where they want to be against this #Packers defense. Clay hit Ryan as he threw. Gunter near int. Automatic review of scoring plays. This is getting overturned, right? Looks like Julio Jones' second foot hit inbounds, slid out of bounds. I would say it's a TD. 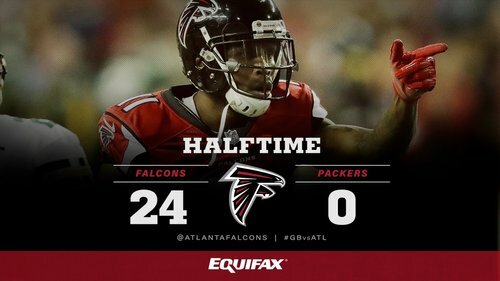 Falcons have outgained the Packers, 320 to 127. Falcons just played an almost perfect first half. Up 24-0. This game is over. Matt Ryan fires a back-shoulder pass to Julio Jones against Gunter. 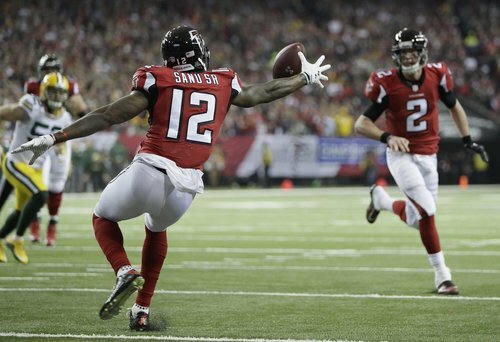 Falcons now lead 24-0. This is a beatdown. #Packers in trouble. #Packers head to the locker room down 24-0. What's gone wrong? #Falcons with 325 yards. Secondary overmatched. Ripkowski fumble was a killer. No Rodgers magic thusfar. What else? 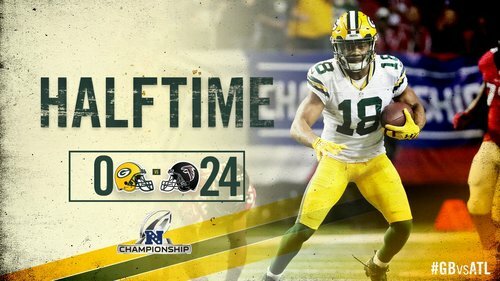 What if I'd tell you Jordy Nelson would have 4 catches for 59 yards in the first half ... and #Packers would be scoreless. 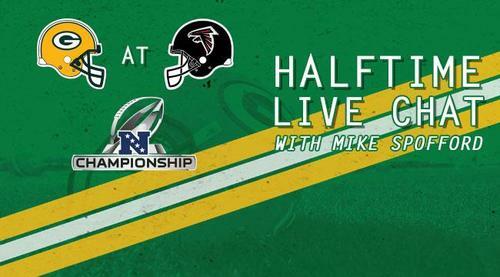 #Falcons OC Kyle Shanahan two steps ahead of #Packers DC Dom Capers en route to 325 first-half yards. Of course, he has far better players. 30 minutes of football left. Time to rally. You knew the #Falcons were going to score points. 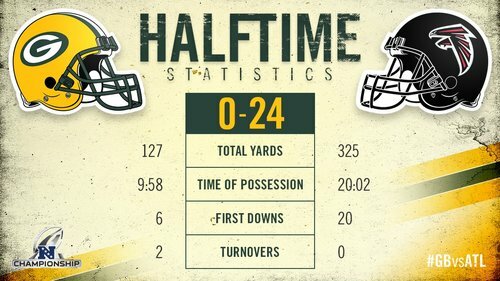 But thought the #Packers would score plenty, too. Missed FG, fumble were killers early. Check out some of the ???? photos from the first half. #Packers 1-for-4 on third down. Minus-2 in turnover differential. Outgained 325-127. Matt Ryan threw for 271 first-half yards. As @RobDemovsky just said, down 24-10 at half but getting the ball to start third quarter would be a lot different than 24-0. Shout out to Ludacris, Jermaine Dupri, and Jeezy for giving our Dome even MORE juice for the second half! Taylor (knee) and Hyde (shoulder) ruled out for second half.